Kaze Tachinu, the latest Studio Ghibli film, opened this weekend in Japan. Its director, Hayao Miyazaki, is stirring up plenty of controversy online. The reasons why might surprise you. They might not. As previously mentioned, the film is fictionalized biography of Jiro Horikoshi, who created the iconic World War II fighter plane, the Mitsubishi A6M Zero. Some of the early reviews called the film "great" and said it was aimed at adults. Children, it seemed, found the film "dull". On the movie's Yahoo! Japan page, many commenters are viciously attacking both Kaze Tachinu and its creator, Hayao Miyazaki by calling the film "anti-Japanese" and Miyazaki "dim-witted". "Yep, this anime is definitely anti-Japanese," wrote one 2ch commenter. "Probably already no good." 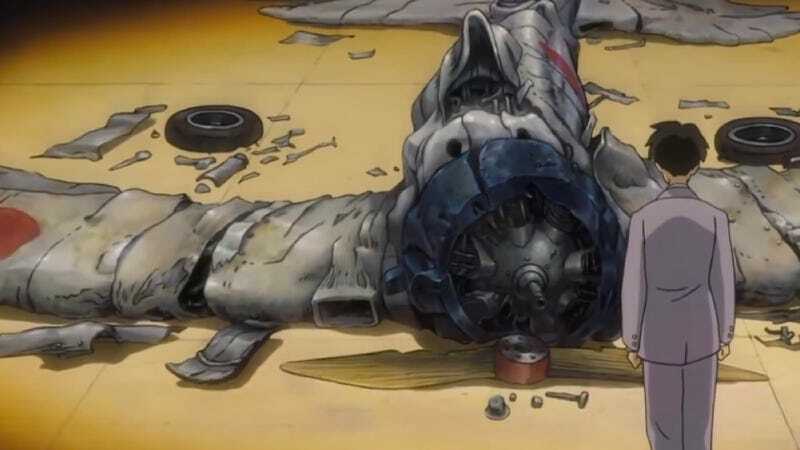 "This anime is a eulogy to the Zero fighter, right?" wrote another. "Considering all that, apologize to the comfort women? I don't get this old coot." Attacks like these appear to be from individuals how haven't seen the movie. So, what's the deal? Is it the movie? No, it's something Miyazaki said. In a recent interview with Studio Ghibli's own publicity pamphlet Neppu, the 72 year-old Miyazaki said, "For the comfort woman issue, because it’s a question of each nation's pride, a proper apology should be given and suitable reparations should be paid." During World War II, the Japanese military created prostitution corps called "ianfu" (慰安婦), which is typically translated as "comfort women". Conservatives in Japan are often quick to point out that Japanese politicians, prime ministers, and the Emperor have apologized numerous times for Japanese atrocities during the war. Compensation has been awarded; however, there's debate over whether it was a suitable amount and whether or not these apologies were fitting. The topic of comfort women is a sensitive issue in Japan—and the rest of Asia. During the same interview (heck, right after he said this), Miyazaki talked about another sensitive issue: disputed island territories. There are island that Japan says are part of its territories, but that Korea and China say are theirs. This topic has gotten so heated that it's lead to massive rioting in China. In the interview, Miyazaki said, "As for the territorial problem, they should either be split in half or there should be a proposal to 'control them jointly.'" Miyazaki added that no matter how much disagreement there is, a case regarding the disputed territory's control should not be presented to the International Court of Justice. "A nuclear covered country like this, it should never be allowed to wage war or whatever," Miyazaki added elsewhere in the interview. Online, there were those who agreed with Miyazaki. Others wondered about the timing. But online in Japan, a place that often can feel more conservative than the country itself, critics have been vocal. "Why don't you pay the comfort woman with the profits from your movie?" asked one Yahoo! commenter. "Wouldn't it be good to ban the movie that this traitor created?" fired off another, among those saying that Kaze Tachinu was the work of a left-wing liberal. "That's it! Ghibli's finished," one went as far as to proclaim. "Well, there goes my desire to see this movie," wrote one commenter. "I'm really disappointed in Miyazaki," added another. "I want him to stop saying political things," wrote yet another commenter. "I only wanted to see it free of any preconceptions..."
Even within all these attacks on the movie and Miyazaki, there were those who found the whole thing baffling: reactions ranged from "What the heck is Ghibli's PR department doing?" to "Since when did Yahoo! Japan become overrun with right-wing Imperial wrath?" The Yahoo! Japan page is turning into a pile-on and currently has over two thousand comments, with people attacking perhaps the world's greatest living animator for saying what he thinks.